It’s my nephews 1st birthday this weekend. So in preparation, my mum and I have slaved away making not one but two cakes. One of which is a dinosaur cake! It took us a VERY long time to make, however, we are very pleased with the outcome! Here is the recipe for you all to enjoy! You will need Four 20cm round greased and lined cake tins. If you can, use a slightly deeper cake tin for the body of the cake. To decorate the features of the dinosaur I used Renshaw ready to roll icing which is available in lots of colours. Exactly the same, except this time, pour your cake mixture evenly into the three 20cm round greased and lined cake tins. Place all 4 tins in the oven for 20-25 minutes or 30 mins for the deeper cake until the cakes have risen and are firm to touch. To check that they are done, put the cake tester into the middle of the cake . If it comes out clean, the cake is ready. The slightly larger cake will be the main body. If you want his tummy to be more round, you can add slices of leftover cake. Start by cutting out a tail from one of the other cakes. You can use a template to help you. Put it near to the body to make sure it looks the right size. Continue to cut out a head and feet, using any leftovers to bulk out dinosaurs tummy and head. Put the body, the head, the feet and the tail all on to the cake board and see if you are happy with sizing and structure. When you are happy, make sure the body is in the centre of the cake board. In a large bowl, place the butter, the chocolate and the milk. Place bowl over a pan of boiling water on a low heat and stir until all melted. Add the seived icing sugar, a little at a time until all mixed in. Cover the entire body of the cake with the chocolate icing. Next, move on to the feet, head and tail. Once the dinosaur is completely covered, put the cake in the fridge to cool. After about 30 mins or so, check that the chocolate icing has set. You can leave it overnight to set. Once dry and not sticky, it is now time to cover the cake in icing and decorate! In a large bowl, knead the white fondant icing, and add a few drops of the ultra violet colouring. Keep kneading and slowly add more drops until the icing is a lilac colour. (You can use any colour icing for the dinosaur, but I wanted him to be lilac). Roll out the fondant icing into a large round shape, you don’t want it to be too thin. Cover as much of the dinosaur as you can and try and keep it as smooth as possible. Trim any excess parts off. Keep rolling out icing and adding to the dinosaur until it is completely covered with purple icing. Don’t worry if it is not completely smooth, he is a dinosaur after all! Next it’s time for the decorations! And there you have it, a dinosaur cake for any occasion! 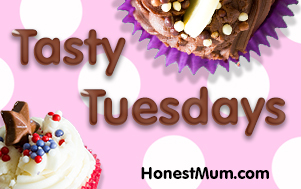 For this post I have linked up with Honest Mum’s Tasty Tuesdays! Be warned: This cake may take you a while…so make it a day or two in advance! Happy 1st Birthday to my little nephew Pip/Andreas the 2nd!! Next Post It’s a Flourless Chocolate Torte Cake!